She was the fastest swimmer in the world. On March 3, 1956, the Dutch swimmer, Cocky Gastelaars, swam the 100-meter freestyle in 1 minute and 4.2 seconds. 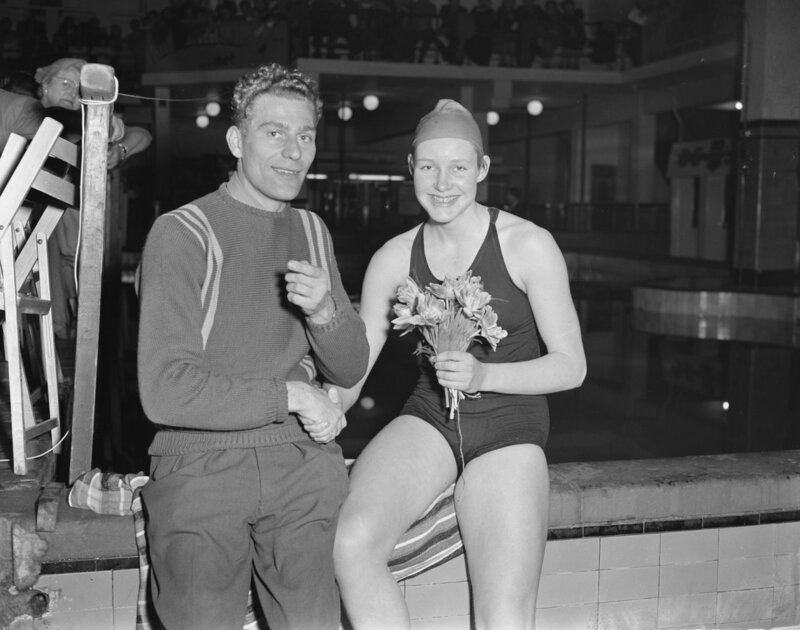 The record had been held by fellow Dutch swimmer, Willy den Ouden for two decades until then. Above is a certificate that Gastelaars received from the FINA, the international swimming governing body. When she broke a world record, Gastelaars told me that special evenings were organized for her, and that she got lots of presents, like food baskets or a pen. She even got a dog. In early 1956, Gastelaars and her coach knew that the world record was vulnerable, and they planned and trained with a vision of breaking that record. When a person is believed to be on the verge of breaking records, very often the community is alerted so that official timers and lots of witnesses are on hand. Five weeks later, Gastelaars did it again. Eight months later, Gastelaars was primed to win gold at the 1956 Melbourne Olympics….when the unthinkable happened. The Netherlands government decided to boycott the Olympics, joining Spain and Switzerland in a protest of the Soviet Union invasion of Hungary. As you can imagine, members of the Dutch Olympic squad were shocked, angry and devastated by the news. Gastelaars never took off for Australia. At the peak of her powers as the fastest swimmer in the world, she was not allowed to prove her championship mettle because of two countries that had nothing directly to do with either Australia or the Netherlands. I was so sad. All the swimmers were. We trained every day together. When the Games (for us )was cancelled, (our dream) was all gone. So we just went back to school. We didn’t say much. People asked us how we feel, but we didn’t talk about it. I felt awful. You work so hard for something and suddenly it’s over. We definitely would have had a lot of chances for medals. In fact, after the Olympics, we held relays in the Netherlands in all the Olympic events. I think we broke three world records in the relays, and the women’s medley. Only recently have officials in the Netherlands recognized the 1956 Olympians who never got the chance to compete. The belated recognition is of course good. But to paraphrase Shakespeare, it is perhaps better to have competed and lost, than to have never competed at all. Posted in Geo-politics, Other Olympics, Swimming and tagged 100 meter freestyle, 1956 Melbourne Olympics, boycott, Cocky Gastelaars, Invasion of Hungary, Soviet Union, world record. Bookmark the permalink. President-Elect Donald Trump: What Impact Will He Have in the Locker Rooms of the NBA and NFL?